Residents of Tacloban, Philippines, queue for aid following Super Typhoon Haiyan (local name Yolanda). As the magnitude of the devastation wrought by Typhoon Haiyan unfolds in the Philippines, the United Nations and its partners are mounting a massive humanitarian operation, battling heavy rains, blocked roads and damaged airstrips and seaports to reach millions across the region desperate for food, water and other basic necessities. The world body’s Humanitarian Coordinator, Valerie Amos, launched a $300 million emergency appeal from the Philippines capital, Manila, earlier today, while on the ground, UN and other relief agencies report that transport logistics remains the biggest challenge due to the widespread damage to infrastructure and the large amount of debris blocking airports, roads and other access routes. Electric lines have been cut and, in some places, heavy ships have been thrown inland. The UN World Food Programme (WFP) said wrecked infrastructure is making humanitarian efforts a “logistics nightmare.” The agency has asked for $83 million for logistics, food and emergency telecommunications equipment. Forty-four metric tons of High Energy Biscuits (HEBs) are due to arrive in-country today from the UN Humanitarian Response Depot (UNHRD) in Dubai, with additional biscuits and rice being mobilized from the region. The hampered humanitarian access is also “contributing to a breakdown in law and order as some desperate people loot shops for food and water,” said UN refugee agency (UNHCR) spokesperson Adrian Edwards said, briefing the press from Geneva. There are also reports from Government partners and others of growing tensions and trauma on the ground, he added, with unconfirmed reports of people destroying bank teller machines and robbing relief supplies. “Women and children are begging on the streets for donations, exposing themselves to abuse and exploitation,” Mr. Edwards said. With power lines still down, UNHCR plans to distribute solar-powered lanterns to mitigate the risks of gender-based violence and enhance the protection of displaced families. A first UNHCR airlift is scheduled for Wednesday from Dubai to the Philippine island of Cebu, bringing tents and other non-food help. The refugee agency has also deployed an emergency team to the Philippines, including protection specialists. “We are looking also for funding for deployment of emergency radio in a box because mass media in the areas is simply not functioning,” UN Office for the Coordination of Humanitarian Affairs (OCHA) spokesperson, Jens Laerke said, adding that OCHA planned to distribute at least 1,000 wind-up radios to help with communication on the ground. “Once we know that people have the bottom line survival means, we move on into the next phase. And the next phase is trying to ensure that the consequences for children of this disaster can be minimized,” said Christopher de Bono, Regional Chief of Communication at the UN Children’s Fund (UNICEF). “Children are the most vulnerable people when natural disasters hit. Children are going to be traumatized. They are going to have been separated from their parents. It’s a real battle,” he added. The International Labour Organization (ILO) is working with the Government, businesses and workers in the Philippines to launch an emergency employment programme to help the estimated three million people who have lost their livelihoods in the wake of the devastation. The ILO is helping put in place emergency employment and ‘cash-for-work’ programmes as part of the relief appeal launched today. The UN Food and Agricultural Organization (FAO) has also begun to support the Government in the reconstruction process in the agricultural, fisheries and forestry sectors with a $1 million of its resources to cover immediate needs such as seeds and fertilizers, its Director-General José Graziano da Silva today said. The typhoon hit just at the beginning of the main rice-planting season, and FAO estimates that over one million farmers have been affected and hundreds of thousands of hectares of rice destroyed. Severe impacts on coconut production in affected areas are expected, and there has also been wide-scale destruction to storage facilities and rural infrastructure. Along the coast the storm surge wiped out many fishing communities, demolishing boats and gear. Meanwhile, the head of the UN Office for Disaster Risk Reduction (UNISDR) today called for a rethinking of the links between disasters and poverty and urged a dramatic scaling up of efforts to protect people and assets. “It is clear that the world is an unchartered territory when it comes to disaster events,” Margareta Wahlström said. In addition, the head of the UN World Tourism Organization (UNWTO), Taleb Rifai, has expressed readiness to support the country in its tourism-related recovery programme. “We call upon all tourism companies, associations and tourisms from all around the world to contribute to the UN efforts being deployed,” Mr. Rifai said, urging the sector to show solidarity with the Filipinos. 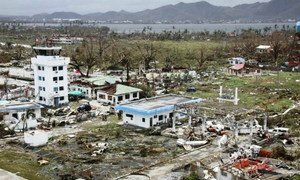 United Nations agencies are working closely with the Government of the Philippines to reach those affected by the super typhoon Haiyan, as the number of reported casualties continues to rise and access remains a challenge in many areas.